Let’s be clear about a few things here right at the top. In Chicago, the offense did a lot of good things that worked out pretty well. For instance, they ran the ball at will and with great effectiveness to the tune of 28 carries for 198 yards which calculates out to a crazy 7.1 yards per carry. We would like to welcome back “21” personnel to the Cowboys arsenal after a long absence. 14 plays in 21 personnel and 3 more in 22 personnel indicate that Tyler Clutts has served at least a temporary purpose. By the way, 198 yards is the highest of the season and also the highest since that day in Baltimore last year where the Cowboys resembled the “Great Wall of Dallas” that was featured last week on A Football Life episode that remembered the dynasty offensive line of Williams, Newton, Stepnoski, Gesak, Tuinei, and Gogan. Back then, you may recall, they pretty much only ran 21 personnel. This was before the day and age of specialized personnel for every situation in every setting. If you review the Cowboys of the dynasty carefully and study them from a personnel and play-calling standpoint (something I have always thought about doing in the offseason), you will find that they pretty much ran 1 personnel grouping in normal situations and another in 3rd Downs. That was the it. That was all they ever did. 2 groupings. And the entire league was pretty much like that, whereas now, this team and many others can roll out 10 different packages every game, never really running the same group 2 plays in a row unless they are in the 2-minute offense. 21 personnel is also known as “regular” personnel amongst coaching people. I remember Jason Garrett once telling me the story of working for Nick Saban with Miami back when Garrett was just getting into coaching. The story was that Saban wanted colors to represent the different personnel groups so that yellow might mean 11 personnel and green, 22 personnel, and red, 12 and then they could call out a color and everyone would know what they wanted but the opponent (at least until this basic code was easily figured out). The coaches around Saban nodded, but then asked him which color would be for regular. Saban thought that was a silly question. “Color?”, he responded, “There is no color. Regular is regular!” If you enjoyed that anecdote, you might be a football nerd. 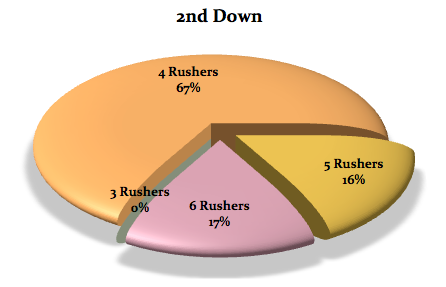 Anyway, 21 personnel, of course, is 2 RB – with one being a FB – and 1 TE with 2 WR. Basically, the personnel that we all grew up watching in the NFL. Pro personnel they might even call it at lower levels because this is what Emmitt, Moose, Novacek, Irvin, and Harper did. It all starts with actually having a FB on your roster and it certainly makes you consider what this season has evolved into over the last few months. They left Oxnard with no plans for a FB and hardly even considered one at camp because they were going to focus on multiple TEs and when they weren’t doing that it was going to be multiple WRs, but never multiple RBs. However, the defense collapsed, and the best way to win the game was going to be to shorten it. And the best way to do that would be to ground and pound with a running game. 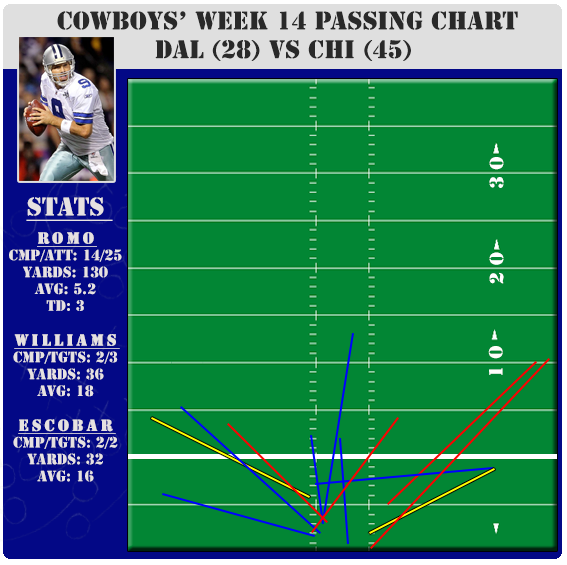 13 of the first 23 plays called were running plays with most of them being 12 personnel or 21 personnel with Romo under center. 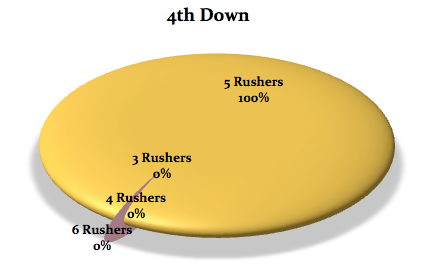 You may remember the Saints game started the same way, with 10 of the first 14 plays being run plays. It is a clear and reasonable plan that wants to shorten the game and move the ball and the clock at the same time. I want to repeat my feelings that it makes sense and is not at all poorly thought out. But, it does require that you extend your drives and if you are going to use 1st and 2nd down to try to stay out of 3rd Down and long situations where the Bears and Saints want to blitz you, then you have to have success or it will still come down to the passing game moving the chains under duress. It worked until the 2-minute offense took a 17-14 game and turned it into a 27-14 game before they ever touched the ball in the 3rd Quarter. That proved to be too much to overcome. Here are some looks at the power run offense which usually hasn’t worked around here and we should consider the Bears defense before we assume it will work every week. 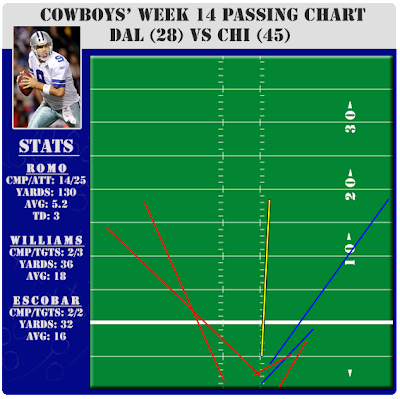 But, on Monday night, the Cowboys looked great with a FB again. Look at Clutts lead the path and keep Murray clean until he is past the first down line. 44 gets the lead with a pulling Tyron Smith and it looks – at least for one play – like Moose taking Emmitt into the secondary. This time, the Bears collapse on the FB hole, and Murray just bounces it outside to the edge. Crazy, but I am 98% sure Clutts is only here because the defense is so bad. They just want to figure out how to better manage games and that has brought us back to 21 personnel for the first time in 2013 in game 13. So, that is great. Good production and the ability to boss the game a bit with a running posture. But, the slightest stumble, penalty, play by the defense or anything leaves you in 3rd and a long haul. And that is when these defenses are bringing everyone to challenge the protection and composure of Tony Romo. The Bears show as many as 8 different guys that can rush, with some blitzing and some just “sugaring” or bluffing that they are actually coming. Look at the crazy math problem everyone is sorting through in the above frame. You must figure out your guy (which average humans might be able to do) but then you must block that guy (which average humans cannot do). You will see the Bears are able to isolate 50-James Anderson on 21-Randle and they win that battle, but also note that 90-Julius Peppers is stunted inside to Travis Frederick. Then, avert your eyes. Frederick is trucked and tossed back into Romo at which point, Romo goes into self-preservation mode and you can’t really blame him there. A real disaster. 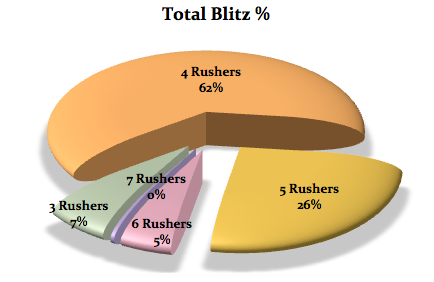 So, if you had to guess, do you think that encourages a defense to bring more blitzes? Me, too. This is a much better job of protection as the Cowboys have 6 blocking a 5 man blitz and it works well enough to give Romo a chance to make a tough throw that cannot get to the spot on time. This is asking a lot of a QB, but on the rare chances to make throws on 3rd Down, it just looked like he had a tough time getting the ball where it needed to go on time on a few occasions, including this one where the throw is late and the defender has closed down Williams and even if it is complete, they still don’t get the first down. There was another 3rd Down throw to Dez in the 3rd Quarter that also goes back to the QB getting the ball where it needs to go. Windy for sure, but that is dealing with conditions and needing to complete passes like the other QB did. And then, this killer, with the game already slipping away. 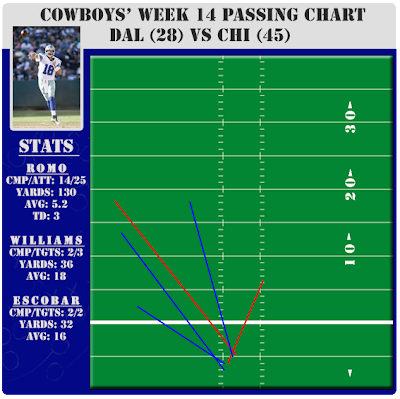 For some unknown reason, Jason Garrett punted on 4th and 4 on the possession before, but then goes for it on 4th and 9. The Bears show up to 8 rushers and then fire zone from Romo’s blindside and that gets him antsy. Watch Romo bring Witten back in to protect, which the Bears counter by bringing the guy who was supposed to cover him (something that I would do every time as an easy way to cancel out Witten’s impact). Also, it sure looks like Romo is trying to tell Bernadeau to get the A-Gap from 50-Anderson (although I am completely guessing). Regardless, this 4th down is dead because nobody got 50. He has a free run at Romo from the closest possible spot and it looks like the Cowboys were out schemed again on another exotic blitz. I am not sure about Romo’s thought process here. This may seem unfair to many readers, but if ever there was a time to attempt a desperation spin or stiff-arm or a tough pass to Murray, it is here. It is 4th and 9. His decision to basically spike the ball into the ground is smart and safe for saving a hit, but it certainly also looks like a surrender. He is beaten up and frustrated, so we should not be too harsh, but I really don’t understand the give-up decision on a 4th and 9. He is acting like Murray should be out there on a screen, but no blockers are heading that way, so I have to say that Romo is just grasping with his gestures here. As the season has developed, opponents are making the Cowboys deal with the blitz more and more. And sadly, the Cowboys still look uncomfortable. This brings more and more challenges that we thought were remedied to an extent with empty and 4 WRs, but the opponents have caught on to that and now we are back to where we started. The Cowboys are 31st in the NFL in converting 3rd Downs on the road (curiously, Kansas City is now worse) and those 3 sequences above show the issues. They just don’t deal with pressure well and a loud stadium makes it worse. They did well at Giants Stadium late, but for the most part, this is a good example of the season’s work. 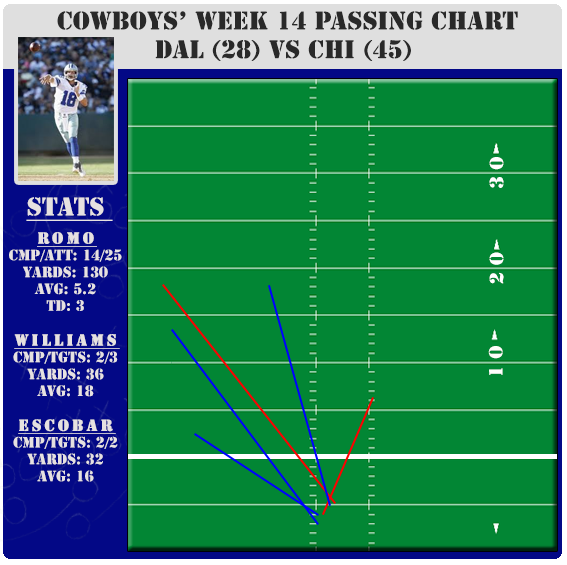 This is a very bizarre showing of Romo’s 2nd half throws for a team that was behind double digits the entire time. As you can see, things got out of hand very quickly and he really never had enough plays to make a throw. SUMMARY: The offense is being asked to do a lot and more than many other offenses are asked to do. They basically have to play well enough to compensate for the defense being so poor. But, that is the decision the organization has made for many years when they have put most of their eggs into skill positions and have had made the decision to select 200 pound athletes over and over instead of 300 pounders. So, in a game like Monday, we must admit that the game-plan was really quite solid. They just never got the “timely passing” portion of the offense right and that comes down to 5 or 6 isolated plays that if they work they get you a fresh set of downs and if they don’t, your entire plan crumbles to the ground. One was a protection collapse, then a poor throw, then a Witten drop, then miscommunication with Murray, then another poor throw, then another protection collapse, and then you are down 42-14 and wondering how things went so wrong when what you were trying was actually working so well for so much of the first half. Like I said yesterday, I realize that the defense is historically bad – I think everyone does – but the only way this team wins anything this year is if the offense drags them over the finish line. Some days they are able to do that, but many days the opponent makes them pass the blitz test. 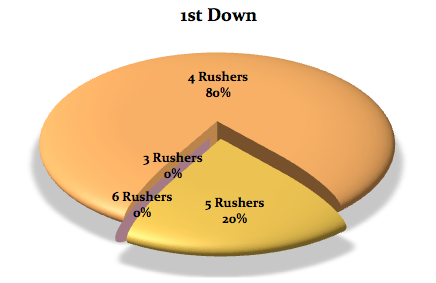 The above chart shows that blitzes come 25% of the time on 1st down, 30% on 2nd Down, and then 40% on 3rd Downs. 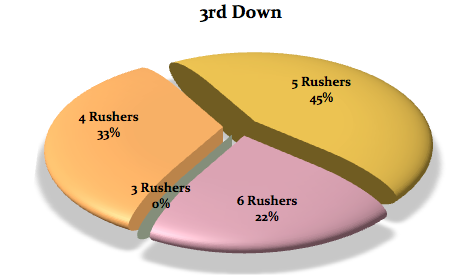 If you break it down to 3rd and long, it jumps to about 70%. 3rd and long on the road? Almost 85%. Kansas City, San Diego, Philadelphia, New Orleans, New York, Detroit, and Chicago have all followed the same recipe. Things change back at home, but teams watch film and study what you like to do and more importantly, what you don’t like to do. And the book is certainly out on what Romo and company do not enjoy – The 8-man front standing right in front of him at the snap.